Reception office chairs are one of the first ways to make an impression on a client. The problem is for a lot of companies they will overlook how important the waiting room furniture is and not get the best furniture possible to impress their clients and settle for something other than the furniture that is going to impress a client. Here are some of the reasons why the furniture should wow your clients. By using the quality office furniture it is showing the clients the business cares about their needs. Yes, these needs may not seem like much, but it does show the client that the business is concerned about even their littlest need like being comfortable while waiting to be seen. 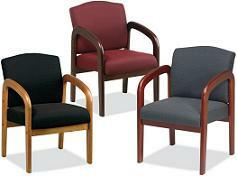 Here are some good examples of the comfort factor clients can enjoy with the waiting room furniture. Cushion thickness is key to recognize as this helps to provide padding to clients when they have to sit for a long period of time. Materials the seats are made from is another feature to consider. Leather tends to provide a more regal look and resist staining that can be present with the cloth furniture which can also retain smells. Amount of sink the seat has is another factor to consider. If the seats sink too much, they can be hard to get out of, but the proper amount of firmness will keep people sitting right in the seats. Buying new reception office chairs is a great idea and a wonderful way to show clients how much a business cares about them. With the right furniture being purchased, it is easy for the clients to know how much the business cares, but also likes to impress clients. Contact us to learn more about our selection of reception office chairs or to place your order with free shipping today.